AIP Batch Cooking and Prep! 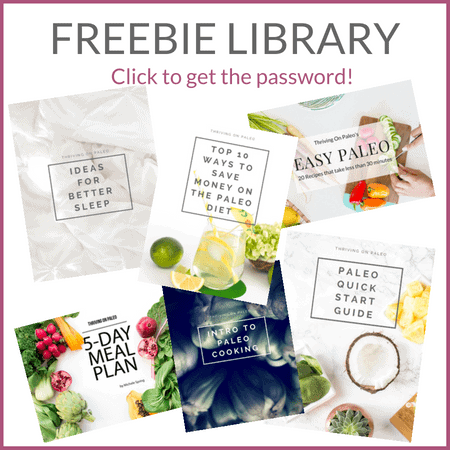 In this post, I explain how I'm prepping for the Autoimmune Paleo Protocol that I'm doing this May for my Hashimoto's Thyroiditis. I show my AIP batch cooking, ingredients I had to order online, and other prep tips that will make this elimination diet much easier for you. That Whole30 I did in March? It helped calm a lot of my Hashimoto's flare symptoms. But I knew I could feel even BETTER as I still had a few signs of adrenal fatigue, gas, bloating, etc that I wanted to get rid of. I mean, why not go for feeling FANTASTIC when you can? I did the full Autoimmune Paleo protocol (AIP) diet back in 2014 to help heal when I first was diagnosed with Hashimoto's Thyroiditis and Celiac diseases, and it helped TREMENDOUSLY. Like I seriously cannot get over how much better I felt after doing it. But alas, you go through the reintroduction stages (my next post will explain what the AIP diet is in-depth) and then go to strict Paleo and when you still feel great you try adding more things in. Then more. Then things you know aren't serving your body well, but you justify that it's not gluten so it can't be THAT bad, and life gets so crazy you just don't f'in care and the next thing you know, you're in a flare and feeling miserable. That was me this winter! Yay for me! So I did the March Whole30 to try to get back on track, and it got me like 80% of the way there. Yet the Whole30 still includes quite a lot of foods that someone with autoimmune disease might not do well with, at least with an active flare or never having been in remission to begin with. Certain foods don't cause issues with healthy people – like nightshades for instance. A healthy person eats them and life goes on like normal. Someone with autoimmune disease who also has a leaky gut? (which is most of us, unless you've actively healed it) We have issues with these foods. They get through our gut barrier, into our bloodstream, where our immune system goes nuts on them and ramps up a full-scale attack. Usually of our own tissue. Even all the so-called amazing herbs and medicinal mushrooms (things like ashwagandha, cordyceps, maca, etc) that are all the rage right now can cause us harm because they are immune stimulants. We don't need our immune systems stimulated, we need them to settle down and stop attacking our tissue. All of this is to say, a diet free of these immune stimulants and full of nutrient-dense food that helps us heal is the pathway to feeling fantastic. That's why I'm doing the Autoimmune Paleo Protocol (AIP diet) in May. You stay on this elimination portion for however long it takes to feel significantly better (or all of your symptoms are gone), and then you slowly reintroduce the eliminated foods one-by-one. I'll get more into the whys and hows of this diet in further posts in this series so if you're like “huh? wha?”, hopefully I'll answer your questions then. Just know I think it is an extremely effective diet for those with autoimmune disease to heal and feel much better – often free of any of their symptoms. The AIP diet isn't something to take lightly as it is a pretty restrictive way of eating. Prepared foods are a lot harder to come by at restaurants and grocery stores, and you do have to make the majority from scratch. Not being able to have eggs and things like paprika make it even harder as many baking recipes are egg-based, and many processed convenience meats often include spices like paprika. However, it's not impossible to do – it just requires a little more prep than you might be used to. The first thing I recommend that anyone doing AIP does is do a search on the internet for AIP recipes that look good or get themselves an AIP cookbook or two. I'll also be doing an AIP cookbook post in this series so if you're looking for which one to get, be on the lookout for that. Once you've got some recipes you're excited about under your belt, then take a look at which ones can be made ahead of time and frozen. Then… make some and freeze some. These frozen little bits will be like gold to you during your diet since you'll have them in your freezer in case of busy times, emergencies, or when you are just too plain tired to think. This vlog video was all about AIP batch cooking – I made a whole bunch of stuff 1-2 weeks ahead of my AIP start date so they'd be in my freezer when I started. I just made these when I had time – on the weekend, while cooking dinner, one random evening, etc. Next, I recommend that you order some of the harder-to-find ingredients online or start your search at home. I often have a difficult time finding some of these things locally, and I even live near one of the health meccas – Boulder, CO. I also highly recommend ordering at least a few meals from Paleo On the Go to keep in your freezer for emergencies. These are delicious and fully AIP-compliant meals that have saved me more than once. The last thing I recommend is writing down ALL of your symptoms that you are currently experiencing. No symptom is too small to write down. As you'll see, this will be important as you progress and things start to disappear. It's seriously magical to see that list and notice that symptoms that were bothering you are gone. It'll help you through a lot and keep you motivated! I'll be updating this series as I go through the AIP diet this May. To be up to date – subscribe to my YouTube channel where I'll be publishing vlog videos every few days with what I'm eating, how I'm feeling, tips, and explanations of things. And sign up for my newsletter to make sure you get notified when I put up new posts and recipes! Black and white pepper are from peppercorns (a fruit), which are not nightshades. You are correct that they are not nightshades, but fruit- and seed- based spices are eliminated on the initial stages of AIP, so black and white peppercorns are unfortunately out. Do you have any advice for someone who is considering starting this who has lots of allergies? I am seriously considering AIP since I have Celiac’s Disease, tree nut, peanut, coconut, red dye 40, lactose free. I have progressive allergies I become allergic to foods every 2 to 4 yrs sometimes sooner. Are they anaphylactic allergies or just allergies that cause other issues/symptoms? If the latter, then definitely work on healing your gut via something like AIP because if you have a leaky gut, so many things can cause issues. Anything that gets through the gut barrier into your bloodstream is considered a foreign invader by your body and your body will act accordingly to try to get rid of it (symptoms then appear). My older son was getting terrible rashes when he was 2 every time he ate cinnamon and walnuts and through a gut-healing diet like AIP (we used the GAPS diet then), he was able to successfully reintroduce them into his diet. If your allergies are anaphylactic though, diet won’t necessarily help them. However, healing your gut may still help you from getting new ones…. I hope you can find some answers soon though! It’s got to be so tough!! Yes my tree nut and peanut are anaphylactic. But my coconut, red dye 40, and lactose are not. These give me digestive issues and hives. The Celiac is obviously not going to go away. I honestly want to feel better. I feel tired and hurt much of the time. I also have difficulties with my digestive system and found AIP looking for a completely different diet.